We at The Broke and the Bookish have a special announcement to make--We're starting a monthly book club. And we want you to join! Each month the contributors of TB&TB will read a book together and discuss it amongst ourselves towards the end of the month. Much like we did with The Casual Vacancy, we will edit and post the results of this discussion. Unlike The Casual Vacancy discussion, you will have an opportunity to share your own thoughts about the book by writing your own posts and linking them to our with Mr. Linky (like for the Top Ten Tuesdays). For the month of June, we will be reading Lauren Graham's new book, Someday, Someday, Maybe. I recommended this book as our first selection because I thought it would be a good read about figuring out what you're going to do with your life--a struggle many of us are facing right now. We're at the point where we need to start thinking about adult things, like finishing school, starting a career, settling down, or even continuing our education. As Franny strives to make it in New York, we're all striving to make it in our own little corner of the world. We hope you'll join us on this new project. The game plan is for us to read the book, discuss it, and have the discussion posted on Saturday, June 29. That way you all know when you will be able to link up your own posts. We'll post again if there are any changes or developments. If you have any questions, feel free to post them in the comments or shoot us an email. So, basically, unlike a review, here we should make a post with thoughts that will most likely have spoilers, right? It's entirely up to you. If you want to write a post of your thoughts, great. If you want to write a more formal review, wonderful. However you feel most comfortable expressing your thoughts on and reaction to the book. Yay! I've been looking to join a book club, but I live out in the boonies, so this will be a great opportunity. 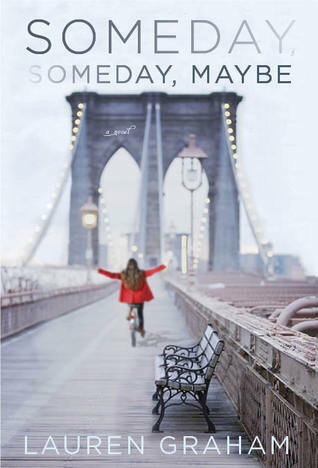 Also, Someday, Someday, Maybe was literally the next book on my TBR list. It must be fate! Good! I hope you enjoy the book. Yay! How exciting! This book has been on my TBR list for a while now, so I'm happy to have a reason to push it up on the list! If I can get ahold of this book I think I'll be joining you! AWESOME! Cannot wait to be apart of it! Fun! I run the book club at work, but I may have to join you guys. I've bought so many books cause of you all. And I had no idea Lauren Graham wrote a book, and I adored her on GG. I'm definitely curious! I have been wanting to join a book club! This is a wonderful idea! Wow! Where did this one come from? I has 100 holds at my local library and we haven't heard a whisper at the store. Oh this sounds fun!! I've always wanted to join a book club! Also, I've been wanting to read this one for awhile too! Love this idea and I'm super excited for the book that was chosen! I love me some Lauren Graham!